Ransomware is advancing at an alarmingly fast pace. The main purpose of the ICS blog is to keep all of our partners, friends, and associates informed of all the latest threats. Awareness is a key defense tactic when it comes to the security of your critical business data. This week’s is a perfect example of how sophisticated the threats are becoming. In this ransomware attack the scammer actually knows the home address of the targeted victim. The Maktub Locker has been the name given to our newly discovered threat. This new scam works by blasting out thousands of emails at a time to potential victims. The email received by the target looks completely legitimate and appears to come from a valid domain. The most convincing part of the scam is that the email actually contains the victim’s home address. That is enough to scare the average person into believing the email is real. 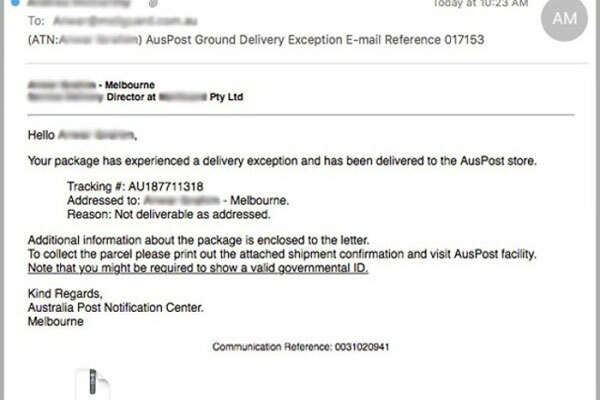 The email spoof appears to come from a legitimate business saying that the individual is past due on an invoice for services provided. It instructs them to click on the link for details on the invoice and services that were provided. The victim gets so caught up on the fact that an unknown business is telling them that they owe money for services that they inevitably click the link and they end up with their computer being infected with ransomware. Without any data backups you will have no way of getting any files back, your only option would be to pay the attackers. Even if you submit to the demanded fee, there is no guarantee that you will actually get any data back. The worst part of this new attack is that the longer the victim waits, the higher the ransom gets. Numerous legitimate businesses from all over the world have been spoofed. They now are receiving hundreds of calls from concerned individuals stating that they have never used their services. It has been reported that the attackers most likely breached a database which contained public records and home addresses of the individuals. The moral of the story is that you need to closely analyze anything before you click on it. These threats are becoming more convincing as the weeks pass. It has now come to the point where they can accurately imitate legitimate businesses and include your personal information. Seeing their home address and a past due invoice invokes the target’s curiosity, and security awareness goes out the window. Don’t let fear take over, always stay alert and realize you must question any link that comes via email. It is better to take the extra steps to make sure you do not bring harm to your business or personal network. In an effort to teach users on how to prevent these types of infections, ICS now offers a Security Awareness service to help you test and educate your employees on how to tell the difference between a legitimate email and an attack like the one outlined in this article. If you’re interested in taking advantage of this service please contact sales as soon as possible.